Francois Louis Moyet and twin brother, Jean Luc, were born May 1, 1966 in Bourges, France. He also has a sister Ann. Their parents are Francis and Yvette Moyet. Moyet began his culinary career at age 15. After three years of college, he graduated with a culinary technical degree. In December of 1984, Moyet went into the army for a year where he was assigned as a personal chef for the colonel and was also selected for an inter regiment competition to follow a 3-month French commando training program. At this time, he received his master’s degree in French culinary art. 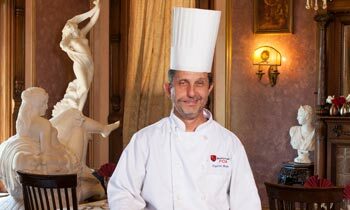 He moved to Paris in 1985 and had varies opportunities to work in prestigious restaurants, “La tour d’argent” being one. During this time, he was blessed with a son, Clavy Guilman-Moyet, born 1986. While at “La tour d’argent,” Francois had the opportunity to feed some of the most celebrated people on the planet at the time, including Queen Elizabeth II, Princess Diana, Ronald Reagan, and Fancois Miterand. 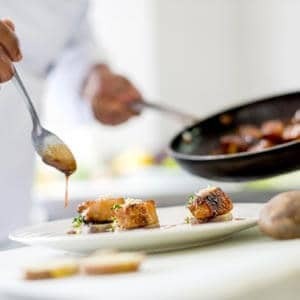 The young chef became a consultant for major food industry organizations such as Danone bsn, Nestle, Picard, Alsace lait. He was selected for an international exchange program with Johnson & Wales University in Providence, Rhode Island. There he met his wife, Catherine S. Holmes, director of the university. They have two daughters, Claire, b 1991 and Mathilde, b 1993. Francois opened three successful restaurants in Paris, “Le Navarin” in 1990, at age 24, and two more “La Rotisserie du Navarin” and “Le Grillon” in 1992. In 1995, he immigrated to Kalamazoo with his family. He opened Kalamazoo restaurants, “Fancois’ Seafood & Steakhouse” in 1995 and then “The Tortilla Flat” in 2003. After selling the restaurants he earned his degree in naturopathic medicine. When the opportunity to purchase Henderson Castle arose, Moyet decided to put both of his unique skills to work. Henderson Castle Boutique Inn and the Naturopathic Spa and Wellness Center were opened to the public September 1, 2011. Moyet also plans to offer classes in herbs, organic gardening with vineyard and orchard, and natural methods of food preparation. Besides having a sous apprenticeship program. Henderson is open for tours. The boutique inn has been expanded to 10 rooms and offers Victorian charm with modern amenities (including wireless connection). This unique site hosts tastefully countless other more personalized evens such as bridal showers, high teas, anniversaries, and holiday events.